KNITTING DATA!!! Complete with tables and graphs. Microsoft Excel, how I love thee. Also, you’re welcome, world. These needed to exist. Table 1. This table displays Shoelaceswitcher’s knitting projects broken down by project type and status as follows: projects finished in 2011 or 2010 (FOs), works in progress started sometime in 2011 (Current WIPs), or works in progress started earlier than 2011 (Ancient WIPs). 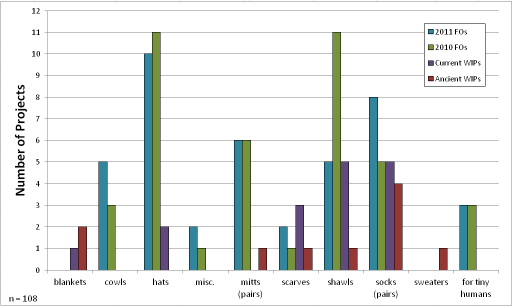 The most knitted project type was hats (total=23) with shawls and socks tied for a close second (total each=22). The total number of projects analyzed both on and off the needles was 108. Figure 1. This figure displays the same information as Table 1 in bar chart form. It is clear that hats and shawls were the most numerous projects completed in 2010 while hats alone were most numerous in 2011, with socks a close second. It is interesting to note that the same number of projects were completed in both 2010 and 2011 in the mitts and items for tiny humans categories. An increasing trend in sock knitting is anticipated as there is the same number of pairs of socks currently on the needles (Current WIPs) as there were finished in 2010. There you have it, folks, a grad-student-style knitting recap. Please note that I did stop myself before trying to total the amounts of yarn used for each of those projects in each year and before attempting any sort of statistical analysis. I’m not totally off my rocker, sheesh! This entry was posted in silliness by shoelaceswitcher. Bookmark the permalink.